Group of people posed on the steps and porch of a cottage. 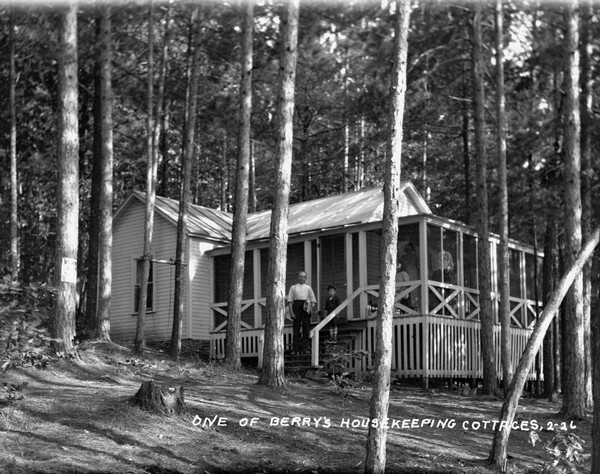 The cottage has a wrap-around porch, and there is a swing between two trees on the left. A man and a boy are standing on the steps, and other people are standing on the screened-in porch. A no hunting sign is posted on a tree. One of 8 photographs of Berry's Coldwater Canyon Hotel by Sherwin Gillett. Not all images are available online.